The Maggie Daley Park Ice Ribbon has been compared to a Mario Kart track or a lazy river at a tropical resort, however, this quarter-mile-long, 20-foot-wide ribbon is purely for ice skating against the gorgeous backdrop of Chicago's skyline. 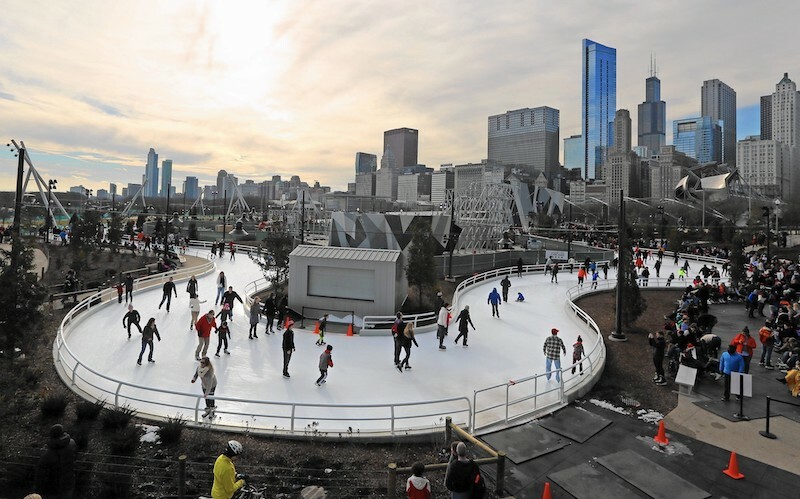 The sloped loop, located in the heart of downtown Chicago, is unlike any other rink in the city. Complementing the ribbon are places to enjoy a cup of hot chocolate, rent skates, and scale the climbing wall. Only downside: It can hold up to 700 skaters at any given time, meaning the lines can be painfully long. However, a $40 Fast Pass allows you to skip the skate rental line and includes skates and locker for one person. 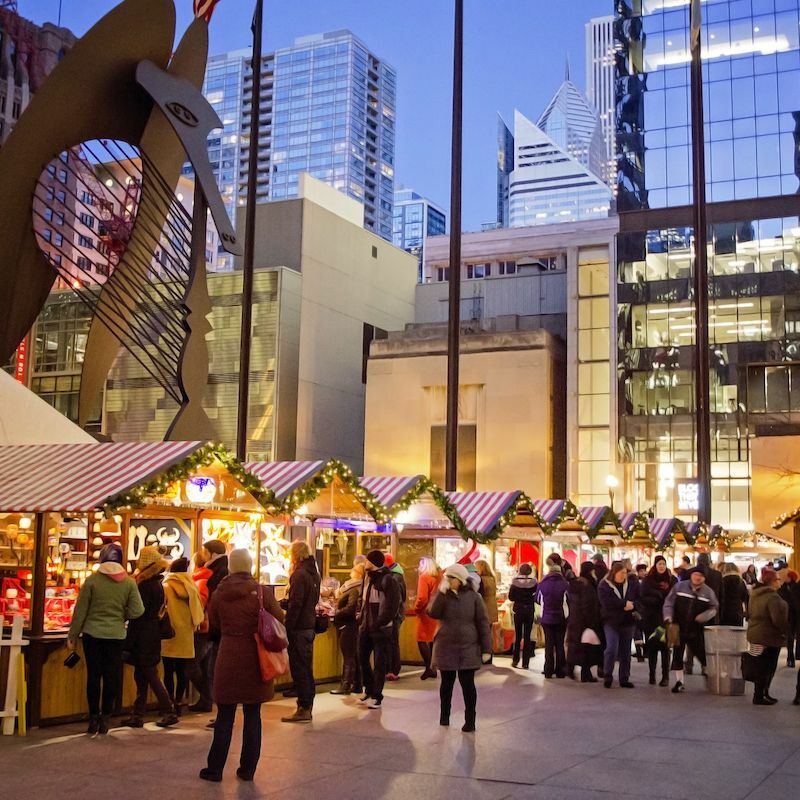 In Chicago's bustling Loop lies The Daley Plaza, where you find a little piece of tranquility and magic during Christkindlmarket. Stroll down the sidewalk of this German-themed market and you will find yourself in a fairytale. The market is dotted with vendors and their red and white striped awnings draped with luminous displays of Christmas lights. Visit the Bavarian Pewter, for example, and find speciality holiday ornaments from Munich, Germany. Then head over and try the original Sternthaler Glühwein from Nuremberg, Germany (hot spiced wine) and a savory strudel! Santa and his crew have set up their Midwest headquarters right alongside the great tree in the plaza. Step into the colorful workshop and find out if you made the Naughty or Nice list. The most wonderful time of year deserves the most wonderful type of event. ZooLights at Lincoln Park Zoo has been Chicago’s holiday tradition for 24 years. The one-of-a-kind experience offers fun, free, family-oriented holiday celebrations that feature luminous displays and incredible seasonal activities…all under the glow of 2.5 million lights! Season: November, 2018 through January, 2019 4:30-9pm on specific dates. Check the website for schedule. Free admission - no ticket necessary! Feel like avoiding the crowds and staying inside the comfort of your home? We have something for that too. There's nothing better than a warm cup of mulled wine or a hot toddy when cool weather hits. This is a great second (or third or fourth!) date option when you want to get to know your date better. Trying a new recipe with your date is a great way to learn or improve a skill together which enriches your bond and gives you lots to talk about. Check out Jamie Oliver’s famous mulled wine recipe, or this delicious Hot Toddy recipe from Epicurious.